← Wordless Wednesday! Feeling a Little Punchy? (2/8/14) Have you ever been in a moment or a situation where you think to yourself, “I wish I could take a photograph of this and remember everything about that exact moment forever?” I rarely have my laptop handy in one of those moments, so usually I take a mental picture. Today, right now, I have my laptop, so I’m going to write about it until I feel like I’ve captured that moment, that feeling. It’s 10:45 pm in New York City and I’m in a hotel bar with a glass of wine and my laptop. It’s a very cool art deco, Great Gatsby era type of hotel. I’m sitting at a table near the window so I can watch the street. The sound of sirens is fading as the ambulance that just passed gets further away. Outside the window, a woman just walked by with a dog in a dress. The Westminster Dog Show starts Monday and many of the contestants and their dogs are staying in my hotel. I met a beautiful, enormous but shy dog in the elevator today. He wouldn’t look at me when I tried to take his picture with my phone. One of my dogs does the same thing. How do they know we’re taking their pictures? They might as well let us because they can’t take selfies. To my right is an odd, to me, Swedish guy who either knows the waitress or is trying very hard to hit on her. He has a full beard, and kind of shaggy, straight, almost greasy looking hair and is wearing a black leather jacket, black wool hat, and what I’m guessing are skinny jeans. I think he knows her. She keeps returning to talk to him. He still seems a bit odd to me. He’s clutching a piece of paper and glancing about furtively. I’m here for a work conference. About six and a half years ago through a set of miraculous and extraordinary circumstances I landed this job, which has taken me to many places I never would have gone, including this weekend trip to the Big Apple. A woman who seems to know me from work somewhere just walked by and said hello and I feel badly that I don’t remember who she is. I regularly meet a lot of new people in my job, so it’s possible that I’ve forgotten who she is, but I think she’s mistaking me for someone else. At some point I’ll crack and ask where I know her from. Why is this particular moment one I want to hold onto? In my life I’ve only had the opportunity to walk around New York City three other times. It really is an amazing city. As you drive into it the iconic skyline looms and you get a sense of specialness. As if just being there is something. It’s one of those places that you see on television or in movies so often that it seems to be more fictional than real. But here I am, sitting right in the middle of it and it looks just like it does in the movies, which is ironic because last spring when they were filming Spider-man 2 they came to my much smaller upstate city to film some of the New York City street scenes. 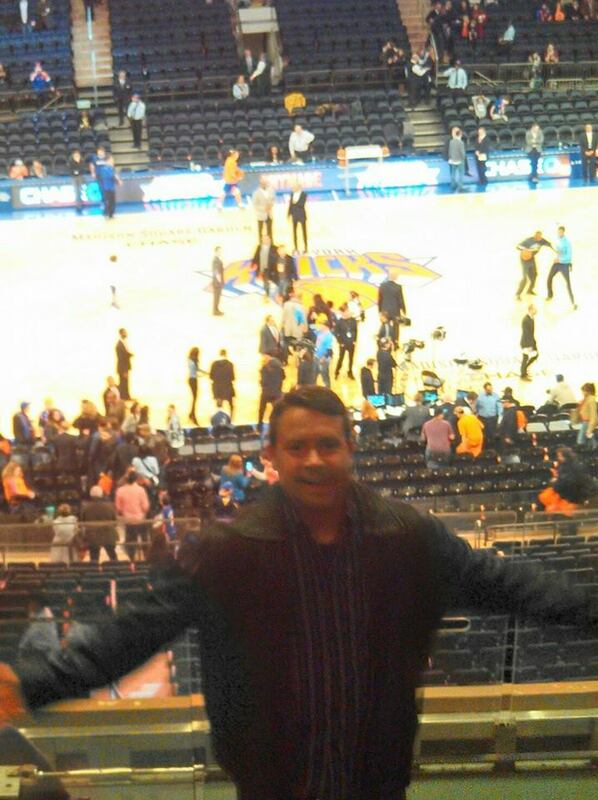 Tonight I went to the New York Knicks game at Madison Square Garden. That was pretty cool. It’s one of those places that seems larger than life because of its history and how often I’ve seen it on television. I got a free bobblehead of the teams star when I walked in. Then I got some popcorn and a beer and found my seat to watch the game. Periodically throughout the game they showed the celebrities in the front row; Kevin Bacon, Seth Myers, Christie Brinkley, and Katie Couric as well as a few others that I didn’t know. I doubt that Kevin Bacon is blogging about me right now, but I had just as good a time as he did. Maybe better. After the game I walked the bustling New York City streets with hundreds of strangers, “Real New Yorkers!” I thought to myself. I tried to act normally and blend in so that I wouldn’t look like the bumpkin rube that I probably am. 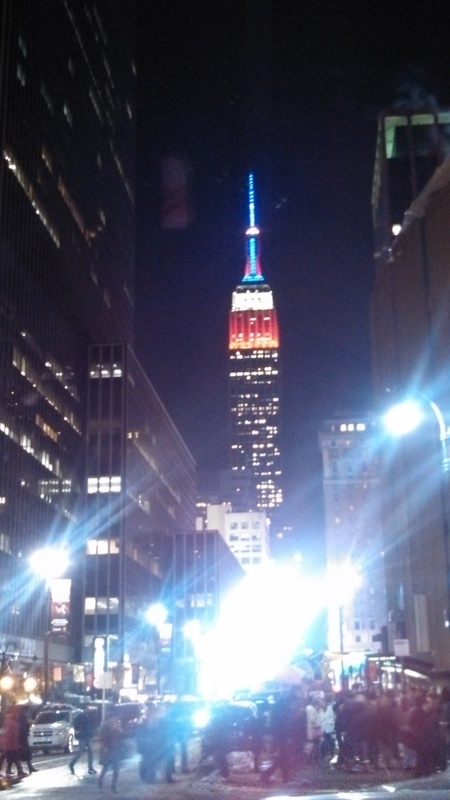 I turned a corner and there was the iconic Empire State Building. When I got back to my hotel I decided that between eating in a diner, walking the streets, going to the Garden and staying in a hotel with dog show contestants, I was having a pretty nice night. This entry was posted in Throwback Thursdays, travel and tagged New York City, The Phil Factor, Throwback Thursday. Bookmark the permalink. You’ve just described what I call freeze-frame moments. They appear completely mundane on the surface, but leave an indelible mark on our memories. Sometimes the 10-year-old person I was looks through my eyes as an adult and is in wonder. I live in New York state but I’ve only really spent time in New York City four times. I do fly through the New York airports quite a bit but that doesn’t count as seeing the city. The last time I was there that I described in the post I figured out an easy way into and out of the city and the hotel is affordable and close to alot of things, so I’m probably more likely to go back occasionally. Used to visit the city a lot and loved it. Your throwback took me back. What is not to like, now that it’s clean and safe(r)? Wonderful place! I love it!! Wish I could go 3 or 4 times a year instead of a handful of times since I was a teen. You did a great job of communicating that special energy you get from being there–you do feel the energy you had as a child. I get so excited by being in a place where everyone walks. I love the museums–oh, yes. Great being able to grab a subway, too–even when you make a mistake, you wind up SOMEwhere, and you can always get back. The architecture, just to look around, and up. Poking your nose inside the churches makes for a rewarding day. Thanks for bringing back some of the fun, Phil.